Ever wish you could be a BIG hero to a little creature that needs help? Throughout the year, orphaned kittens and puppies are brought to the Humane Society of Greater Miami. Quite often, these tiny newborns barely have their eyes open and cannot yet eat on their own. These helpless little pets require round-the-clock care, special food, and weeks of nurturing before they can be placed into their forever homes. Have a flexible schedule (to allow for consistent care of the fosterlings, some of which may need to be bottle fed every few hours, 24 hours a day). Have plenty of space in their home to care for these increasingly active babies, including enough space to keep the fosterlings separated from their own pets. 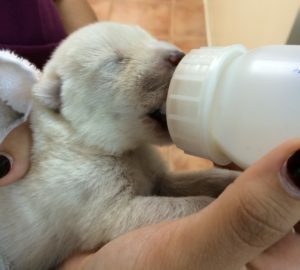 The Humane Society will provide all necessary supplies to care for the orphaned puppies or kittens. The foster parent provides all the caring of the orphaned baby until he/she is physically and socially ready to be adopted into a permanent home. Below are four videos that will provide visual, step by step information on how to care for orphaned baby pets. For more information, please email [email protected] or call 305-749-1821.